A pair of American barns at a new, purpose-built racing yard in Newmarket has won a national award. The barns at Rathmoy Stables, a purpose-built training yard for up to 78 racehorses, backing onto the Newmarket Racecourse gallops, won best equestrian project in the hotly contested Rural and Industrial Design and Building (RIDBA) awards on Friday 17th March 2017. 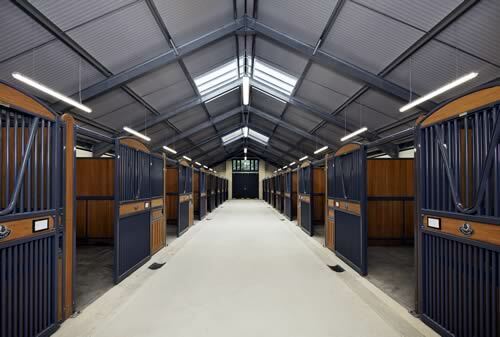 They were constructed by Ely-based steel frame building contractor MD Anthony who were also a finalist in the same category, with the covered ¾ furlong training ring at the same yard designed by equestrian specialists KWA Architects of Babraham, Cambridge. The previous yard facilities had needed substantial refurbishment but the decision was made to demolish them and rebuild from scratch by a third East Anglian firm, main contractor PB Doyle of Newmarket. Unlike standard American barns, the new ones by MD Anthony are built in a traditional style but using modern materials such as slate roofing using composite panel tile support system, and bespoke vented turrets. Each houses 18 boxes with rower and rub partitions and a central tractor way. They were praised by the judges for their highly detailed finishes and pleasing aesthetics. As with a prestigious racing yard, there was an expectation to build to an extremely high level of quality with a detail of finish to standards expected by the racing fraternity. During the build process, and conscious of working adjacent to other racing establishments, a level of site tidiness well above the norm was expected, while noise levels were to be kept to a minimum avoiding disturbance to neighbouring yards and the Jockey Club gallops. MD Anthony's prize was a mounted podger or spanner! Managing director James Anthony, whose father Malcolm founded the company 38 years ago, was presented with his award by TV presenter Kate Humble during a black tie ceremony at the Radisson Blu hotel in Cardiff. "We were delighted to win this award, not just for ourselves but because it recognises the breadth of talent in the region for designing and constructing standout buildings."